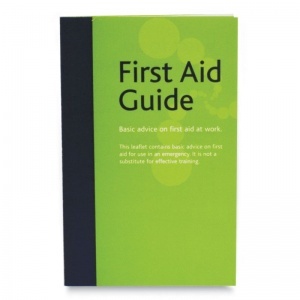 The First Aid Guidance Leaflets (Pack of 50) are essential guides covering basic advice on how to deal with a multitude of accidents that can occur in the workplace. They cover basic techniques on how to effectively perform CPR, and how to deal with more common incidences such as bleeding, breaks, sprains, burns and eye injuries. This First Aid Guidance leaflet is full of clear and useful instructions to guide someone through basic first aid practices. It is easy to understand, meaning that even someone who is not trained in first aid can easily follow the guidelines set, however it should not replace formal first aid training. These guidance leaflets come in packs of 50 to ensure that you always have some instructions to spare. Display them around the office to keep your employees well-versed on how to handle simple first aid situations, and keep them in all mandatory workplace first aid kits along with all of your safety provisions. This guide also comes in a multilingual version for those who are not native English speakers. 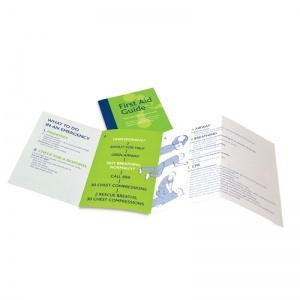 The First Aid Guidance Leaflets (Pack of 50) are usually dispatched via First Class Royal Mail and delivery should be within 1 to 3 working days.